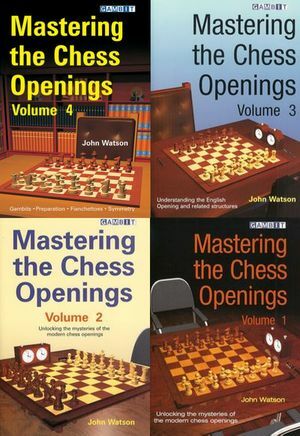 First impression: John Watson's "Mastering the Chess Openings - Volume 1" seems to have what it takes to become another Watson classic! Watson starts with 86 pages of general opening advice, especially focusing on 'structure'. He then moves on to extensively explaining the ideas behind the open games and semi-open games and 'interconnects' to other openings while explaining the subject opening. A revolutionary concept! For many chess-players, opening study is sheer hard work. It is difficult to know what is important and what is not, and when specific knowledge is vital, or when a more general understanding is sufficient. In his previous books on chess strategy, Secrets of Chess Strategy and Chess Strategy in Action, he explained vital concepts that had previously been the domain only of top-class players. Moreover, he did so in ways that have enabled them to enter the general chess consciousness of club players. Here he does likewise for the openings, explaining how flexible thinking and notions such as 'rule-independence' can apply to the opening. In this major two-volume work, Watson presents a wide-ranging view of the way in which top-class players really handle the opening, rather than an idealized and simplified model. This volume, focusing on king's pawn openings, is a book that will make chess-players think hard about how they begin their games, while offering both entertainment and challenging material for study in openings such as the Sicilian and Ruy Lopez. International Master John Watson is one of the world's most respected writers on chess. His groundbreaking four-volume work on the English firmly established his reputation in the 1980s, and he has produced a string of top-quality works since. In 1999, Secrets of Modern Chess Strategy, Watson's first book for Gambit, won the British Chess Federation Book of the Year Award and the United States Chess Federation Fred Cramer Award for Best Book. His former pupils include the 1997 World Junior Champion, Tal Shaked. Thanks a lot! I look forward to read the part on the Reti. Classic books from excellent author. I have them already, just want to recommend them to everybody. Last volume also has very good recommendations and suggestions how to actually build your personal opening repertoire.